Sometimes I wear glasses frame without lenses for fashion sake, just to give it a change and look trendy. Nowdays, Eyewear is now embraced as a fashion statement and accessory for the trendy, no longer the trademark of a common nerd. In fact, even those with 20/20 vision are donning a pair of thick plastic frames just to keep up with fashion. Eyez Optometry since 2007 has created its business based on the commitment that every piece of eyewear available in store has to be a perfect fusion of art and science. 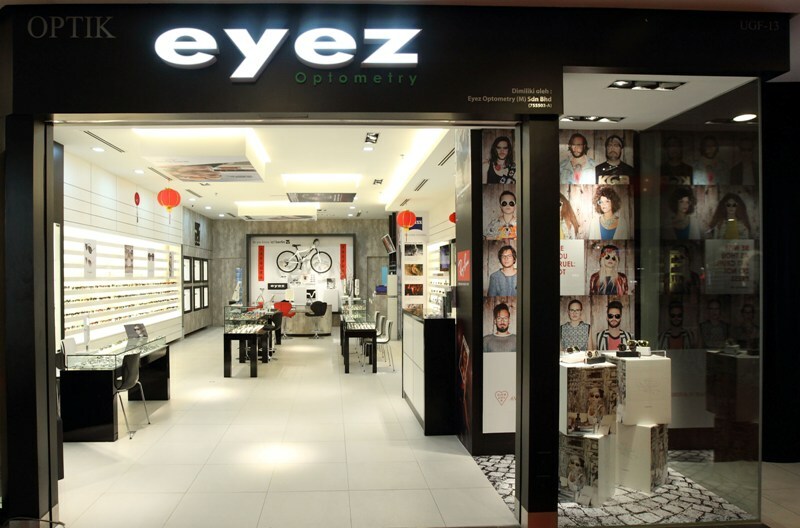 Its first store, located within the Bangsar Village II Shopping Centre, Eyez Optometry moved on to open its second store at Mont Kiara within the next 3 years. Expect to find the whole nine-yards for all your eye care needs when you step into any Eyez Optometry outlet. Eyez Optometry is the sole and exclusive distributor for luxury eyewear frames and sunglasses brands, namely, Jason Wu, Andy Wolf, Derek Lam, Face A Face and Philip Lim. Quality performance lenses of reputable brands are available in store to work in hand with any eyewear frame of choice. For those who prefer to go bare, Eyez Optometry stocks up on a wide selection of contact lenses and solutions. Eyez do not only cater to fashionable adults. Style starts young here. Eyez Optometry boasts a large collection of kids and teen eyewear. Other that the fun stuff, Eyez also offers some serious solution to myopic (short-sighted) kids with the special lenses called the Myopia Control Lenses. Qualified optometrists and opticians are on hand at all times to conduct thorough eye tests and consultations. During the Eyewear Showcase, Eyez Optometry showed off stunning eyewear pieces from these exclusive labels; Andy Wolf Austrian handcrafted and non-mass produced. These are truly a handmade luxury article. Each pair takes weeks to finish and are hard wearing and long lasting. Well loved by stars like Lady Gaga, Hugh Jackman and Eric Clapton. More than a decade in the international fashion scene, Derek Lam is a global luxury brand that is synonymous with the promise of uncompromised quality. His touch is especially sophisticated: modern but never cold, fantastical but always rational. He strives to make fashion that is timeless in its elegance. His creations are well received by A-list celebrities like Jessica Alba, Taylor Swift, Liv Tyler, Julianne Moore and many more.